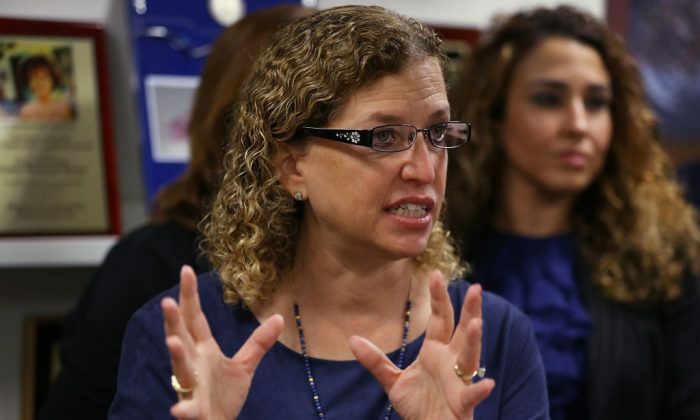 The Pakistani IT workers hired by 30 Democratic members of Congress, including Debbie Wasserman Schultz (D-Fla.) maintained “continued unauthorized access” to Democratic Caucus computers and frequently accessed computers in a government conference room, according to two reports from the Office of Inspector General (OIG). The OIG reports from Sept. 20 and Sept. 30, 2016, were included in two PowerPoint briefings allegedly given to Speaker of the House Paul Ryan (R-Wis.), Minority Leader Nancy Pelosi (D-Calif.), and the Committee on House Administration. A transcript of the presentations was obtained by The Epoch Times. The presentations back concerns that the Pakistani IT workers were involved in a case of corruption involving Democratic officials, fraud, blackmail, and other potential crimes. The new claim that “sensitive House information” was being stored on the computers challenges the current narrative, pushed by the Washington Post, that the server contained “homework” and “family photos” from the IT workers’ families. All five of them, it states, “collectively logged on to the Caucus system 5,735 times, an average of 27 times per day.” In addition, it notes that Alvi “logged in to the Caucus computers 291 times over the 7-month period.” Another server, it notes, was logged in to 5.4 times a day, with 1,154 logins. At the same time, it notes, there are signs the individuals were trying to cover their tracks. The Caucus Chief of Staff, it states, even asked one of the IT workers to not provide IT services on their computers, but the individual continued to access the computer regardless. While the report doesn’t draw conclusions, it does say the actions raise concerns. “Excessive logons are an indication that the server is being used for nefarious purposes and elevated the risk that individuals could be reading and/or removing information,” it states. It adds that the computers “could be used to store documents taken from other offices or evidence of other illicit activity,” and that the individuals could have used the computers to gain access to other systems they weren’t authorized to access. To top it off, the report notes the IT workers had not been vetted, and had not had background checks. The report adds to the growing scandal around Schultz, the Awan brothers, and a handful of Democrats. Rep. Scott Perry (R-Pa.) outlined the seriousness of the growing scandal during an Oct. 10 hearing in Washington and noted there still doesn’t appear to be a proper investigation into the case. In addition, Perry noted that the 5,700 logins by the five Awan associates were found on a House server belonging to former Democratic Rep. Xavier Becerra, who is now attorney general in California. Becerra’s server, he said, “was actually housing the entirety of the servers of all the member offices that employed Amran or his associates. All of it. The entirety,” which violates House policy.